Typing this short post from the passenger seat of my car, staring out over the Pacific Ocean in Santa Barbara. My next"to-do" tonight is called "Nite Moves." It consists of a 1 kilometer swim, and then straight to a 5K run. 3. It costs $20 bucks. 1. Do you do things that are difficult? Do you say yes to things that challenge you? I'm going to jump into 60 degree water, and swim 1,000 meters. The wind is choopy, the water is deep, and about 100 or more people want to go faster than me. I like to practice on the small things...so that when it's time to perform on the big one I'm ready; I'm comfortable; I'm prepared. What can you do this week that is hard? 2. This is big. I drove here from Ojai (30-ish miles) and there are a lot of people. The event takes over the beach, and the hill we climb at mile 1-2 is HUGE! Do you "chew" on things bigger than what you normally do? Sure, I could have swam in the pool in Ojai, and run through the valley...but this is big! 3. Pay...and I play. How about you? 4. Tonight is the last one of these this summer. I heard about it on Sunday, after racing the Santa Barbara triathlon. I said to my friends, "I'm going to that." Been thinking about it ever since! 5. And, of course, I love this stuff. Ever since I weighed in at 172 (in 1999) and realized SOMEthing was going to have to change (I'm only 5'4"!) I've been into this multisport lifestyle. Ok, I see people getting their wetsuits on...gotta (go swim and) run! What does 100% look like to you? Would you know it, if you saw it? When the dial is turned all the way "on," just what does that look like? 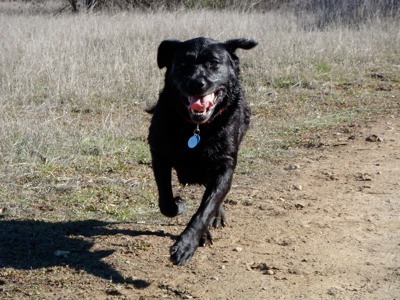 That's Zuma, our Lab, and I took this while we were playing down in the river bottom, here in Ojai, California. It was quite some time ago, as I remember she could run a heck of a lot faster than she can now. ...she's always ONLY doing, what she's doing RIGHT NOW. Of course, I'm not a Lab. At any given time I've got to have "many irons in the fire." Yet, occasionally, I reflect on this concept of giving everything I've got, to what I'm doing right now. Today's challenge: What could you do, and only do that for a little bit of time, from start to finish? Focus on it, work on it, and get that one done! Have you ever had the thought, "Someone should..."? I used to. Then, I started searching for the answer to this question: "Who is?" 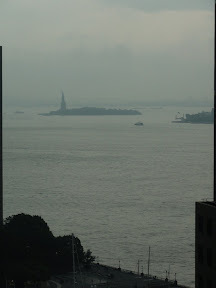 Working here in new York, I do get to see a lot...and, I know I miss a lot too. This isn't a bad thing; in fact, it works in our favor! If you think about focus and productivity, you will quickly realize that there just isn't room in your mental or physical "space" to actually consider it all. So, we have to ignore some things. So, how do you stop shoulding? Easy, notice what you're shoulding about! Begin by writing (yes, I always promote the process of "getting it out of your mind") down those things that you think really SHOULD be different. Now, what will wind up happening - if you're honest with yourself - is that you'll wind up with 20, 50 maybe even (I've seen it!) over 100 things you think "should" be different. Included in that list will be things you think you should be doing, things you think you think you should have, or things you think should be happening. Start from there, and try out these three tips. #2. Take an action, however small, to begin changing it. "Jason," you may be saying, "I just can't put this off any longer!" Well, then, get started. Do something small. Buy a book, subscribe to a magazine, register for a class, join a local group/club. Do something with the double purpose of: "Informing" and "Actualizing." You can get the information in, and find some actions to take by looking through the resources you have nearby. #3. Ask for help, seriously. Here's a crazy idea: Ask for help. I can tell you story after story of how much time (and money...and energy...) I have saved over the years by letting a small group of people know what I'm working on! I do this via Twitter, my blog, my facebook wall...oh, and by phone, mail, email and in person! With a little bit of action, you'll find out pretty soon if it's time to take action, or if it's time to let go of that should. Good luck! 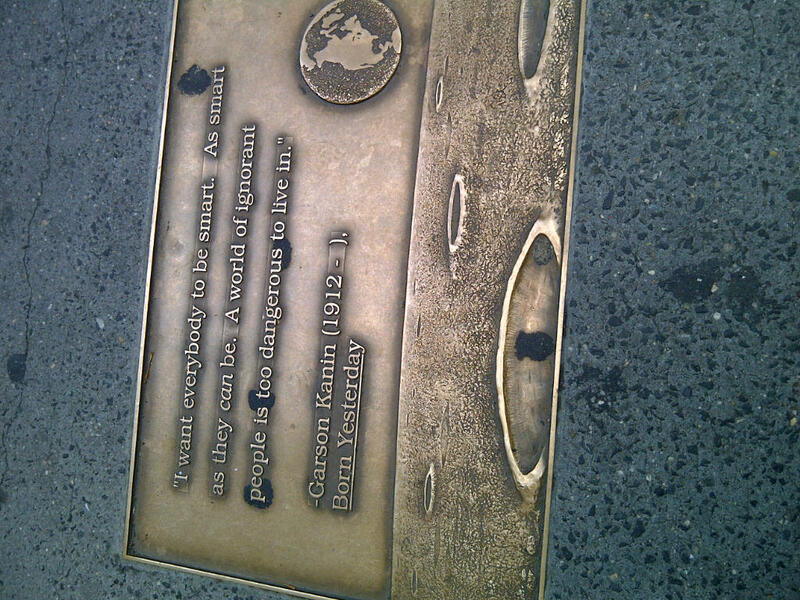 How "smart" do you want people to be? How can we set ourselves up to be our "best?" I'm going to have a short meeting with a mentor of mine this morning, all because of something he said a couple of months ago: "Jason, do you love the problem?" 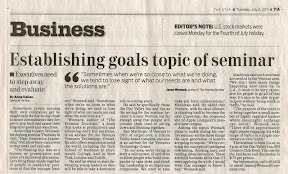 It got me thinking about this "chosen profession" of mine, advising the world's busiest business leaders, working together to create productivity and performance-based solutions to their pressing needs: Getting more done, faster, on a smaller budget, with fewer resources. 1) I read the book by Mitch Albom, Tuesday's With Morrie, years ago and it had a profound effect on me. People will wish they spent more time on their MITs - their Most Important Things. 2) There are shortcuts - what a teacher of mind Russell Bishop calls, "Workarounds" - that we can implement to brigade the growing gap between "idea" and "action." In fact, in order to up level your game, you're going to have to do "more with less" and work much, much smarter. 3) Doing more is more fun. Bottom line, I WANT to solve one of the world's biggest problems 'cause it sets me up to work on the next big problem I identify. Sure, this kind of hard work isn't for everyone. As I am reminded all the time, "Deep thinking is hard work." However, if you're looking for big, worthwhile, life-changing ideas, let's talk. Between the two of us, I'm sure we could come up with a new problem to love! Thanks again, New York, for the opportunity to share this information with you over a few hours last Wednesday. I remember earlier in the morning, about 20 minutes before we started, someone asked me, "Jason, do we really need an entire day for this seminar?" Here was (and is) my question back when someone asks me that: "When was the last time your manager and/or team gave you an ENTIRE day to go off to another room and think about how you work ... instead of think about what you need to think about when you're working?" I did promise I'd get anyone a copy of my previously published book for their iPad/iPhone. Just let me know, I'll email it to you right away! Ok, so here's a bit of an overview of the information I presented. 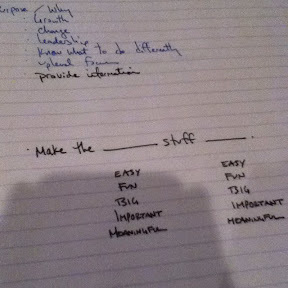 Of course, your workbook will have all of your notes and a lot of ideas that I discussed. Also, I'm you can see the SlideShow presentation I made for the day over at www.slideshare.net/JasonWomack. Again, we start by identifying something as possible. You set a goal, see an email, get invited to a meeting, buy a book...the list goes on. In a typical day, it might be interesting to keep track of just how many "options" present themselves; just how much do you have to consider doing (and not doing) to get all the work done you have to do? Defining your work, your projects and the expected results you're aiming to achieve "may" be a full time job! I talked about the importance of Deep Thinking, the ability to get lost in a project, or to discuss around the periphery of an idea to see what you have not seen before. For those of you doing research as a part of your job, it's important to be able to see things from different angles, and to do that it helps to have some idea of the direction AND destination you think you're heading in so that you DO wind up seeing as much as possible. I always write the word "experiment" with a little e. Why? It just takes a little experimentation to find out whether or not something is worth doing! Did you consider signing up for reQall? Take just a few minutes and do that now. Then, when you're out and about this week, use it just 5 times. See if that service "might" help you out; I know it has helped me! Finally, Assess what you're doing, what you've done, and what that is leading to. The last couple of pages in the workbook outline a very specific (and easy-to-implement) weekly debrief process. A "less formal" way to do this would be to stop for a minute or two each Thursday or Friday, and add a few thoughts to an ongoing list of things you've finished/worked on/been a part of lately. Just having this to look back on at the end of the month/year will go a long way in helping you Identify (back to step one!) what to take on next. The first "group" activity was to discuss practices of effective and ineffective coworkers. Consider going back to your notes to reflect on the habits and behaviors of the people you know you can count on. Can people count on you to do those things? Also, review the way you're ending meetings, preparing for conversations and leaving your workspace at the end of the day. Are you capturing all the ideas, getting ready for tomorrow, leaving the office to head in to your life? During the seminar, we looked at the different ways that people work. Some people think in terms of nouns and verbs, and we all work according to our Auditory/Visual/Kinesthetic preferences. Several activities throughout the seminar are designed to give you the insight and information you can use to change the way you work, and ask to work with others, so that you're as effective as possible. One of those activities was over on page 6 of the workbook. There were THREE workplace performance inventories you created during the course. 1. What do you do by about 10am? 2. What tools/systems do you count on daily? 3. What could you do about once a month to reset/refresh? Each of these inventories was built up to give you "more objective" information about what you need to do, and how you need to be in order to do better work. remember the activity of coming up with your own "recipe" describing when you are "at your best?" That was also designed to give you ample information and plenty of time to think about how you think, so you can think about what you have to think about. THEN, we dove deep into systems-thinking. I presented many ways you can maximize such tools as Microsoft Outlook and your BlackBerry. Of course, I'll always be researching different gear, so that I can always give you the most "up to date" material. If you'd like to see a lot of videos on some of the ways you can save time WITH your tools - often even getting MORE work done, faster - just email me. I'll send you some specific links. Or, of course, you can check out the YouTube channel dedicated to this topic: www.youtube.com/jasonwomack. My question to you: "What did you implement?" What did you go back to your desk to try right away, and...how's that going? I look forward to hearing all about it. Please do let me know in the comments area below! Ok, so here I go on one of my little rants. When someone complains about not having enough time, and then proudly states they don't have time to learn how to save time - you know those people...they are THAT busy - I just smile. 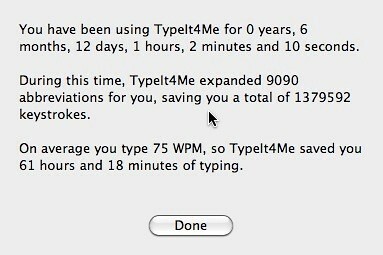 Yup, that's one million, three hundred seventy nine thousand, five hundred and ninety two keystrokes I've NOT typed. What would YOU do with an extra 61 hours? What I promise for my next book. When do you get to talk about leadership? Leadership: It's a big topic that people spend time, energy and focus studying, often hoping that the people around them do more of it themselves. Whether you attend a formal "off-site, leadership development program," read books and think about it on your own, or get together with like-minded people and talk about ideas you all have, get out there and start your next journey. And, I invite you to participate in the next luncheon here in Ojai. Setup, the less I have to think about it, the better. Whether I'm presenting a seminar or racing a triathlon, not having to think DURING the event is key to a strong performance. But that freedom isn't free. I labor over the details, practice "off the field," wake up in the middle of the night with the next great experiment and ask mentors for advice all the time. I'm always amazed by the amount of time I get when I'm prepared to do what it is I am planning to do. This morning, I actually had time to draft 3 pages of ideas into my new spiral-bound notebook (all about the chapter I'm writing this week on feedback and the process of career development). If you can predict it, anticipate it. And, if you're that close, do something about it now so that it's easier then!